This is another great recipe for those nights when you want something great to eat but don't have a lot of time to slave over a hot stove. The best part is that it only takes about 30 min. from start to finish and can all be made in one pot. So, no extra dishes. Really, you can't get any easier than that. All you have to do is combine the sauce ingredients in a pot, throw in some chicken pieces, fresh or frozen (chicken breast tenders or thighs work best) and just let it all boil until it's cooked through. That's it. So easy, even a child could do it. Then, serve it up with some rice and vegetables and you've got a dinner that will be requested time and again. Combine the ingredients for the sauce and whisk together in the pot. Add in the chicken pieces. (if needed, double the recipe for the sauce to cover all the chicken). Cook on high heat until it reaches a boil. Then, turn down to medium heat and let it simmer for 20-30 min. until chicken is cooked through. This is one of my family's all-time favorite dinner recipes. It comes from Sam Choy's Cookbook, though I can't remember exactly which one it is. However, after making it multiple times, I do have the recipe memorized to a tee. It is so simple, quick, and easy to make, but it tastes amazing. It's the perfect dish because it works for casual suppers as well as those times when you want to make something that looks fancy and appears elegant (but really only took you 30 min. in the kitchen). As for the ingredients, they can be found in any Asian grocery store. Just mix up the sauce, throw in your salmon fillets (it's alright if they're frozen, they'll just take a little longer to cook), and let the whole thing simmer for 30 minutes until the salmon is cooked through. That's all there is to it. So, now that you know the secret to this "gourmet" meal, I suggest you make it as soon as possible. It'll be a winner. Combine the ingredients for the sauce and whisk until the miso is dissolved. Put the salmon fillets into a pot, cover with the sauce, and cook on high heat until the mixture boils. Once it boils, turn the heat down to medium and let it simmer until the salmon is cooked through (pink and flakes with a fork). Stir occasionally to prevent the salmon from sticking to the bottom of the pot. Serve with rice. Garnish with green onions, if desire. I love making biscotti, all kinds - chocolate, plain, with dried fruits or nuts, dipped in chocolate, you get the point. I also love knowing that I can have these delicious cookies anytime I want without paying those ridiculous prices for them at the store. After all, homemade beats store-bought any day. That said, one of my favorite types of biscotti is a spice biscotti. Unfortunately, I could never find a recipe on the Internet that satisfied me in terms of flavor. So, I brainstormed a little and created my own using Martha Stewart's biscotti recipe as a base. And so, the chai biscotti of my dreams was born. Chai is basically an incredible flavor made from combining various spices - cinnamon, ginger, cloves, cardamom, and white pepper. You can up the flavor of the biscotti even more by adding in dried fruits or nuts. I've tried various things in the past, cranberries and almonds, candied ginger and cashews, but my favorite mix-ins are cranberries and candied ginger. They really work well with the spice flavor. Plus, the ginger adds in a little extra sweet hot kick. 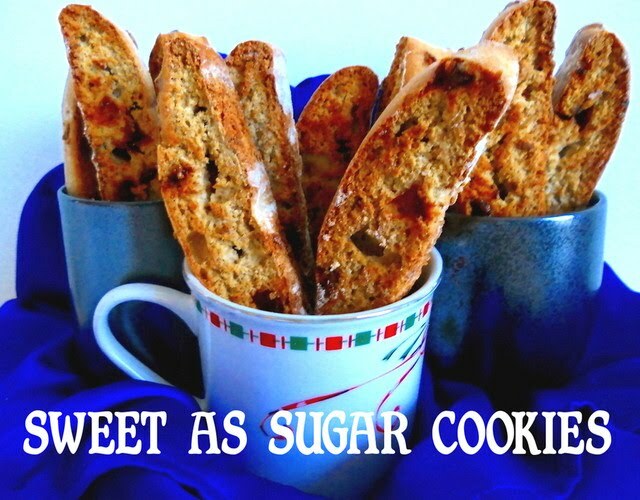 All in all, once you taste this biscotti you will never have a desire to get your biscotti from the store. Trust me. Note: My changes to the recipe are in italics. Place cranberries in a bowl with the boiling water. Let stand until plump, about 15 min. Drain well and set aside. Combine the flour, baking powder, salt, and spices. Set aside. Cream the butter with the sugar. Add the eggs and vanilla. Add the flour mixture. Mix in the cranberries and chopped ginger. Turn the dough out onto a floured baking sheet and divide in half. The dough will be somewhat sticky (flouring your hands makes it easier to handle the dough). Shape each piece into a 16x2 inch log. Flatten the logs slightly to about 3/4" thickness. Bake at 350F for about 25 min. until it is firm to the touch. Immediately slice into 1/2" thick slices (diagonally if desired) with a serrated knife. Lower the oven temperature to 325F. Place the pieces cut side up on a baking sheet and bake 15 min. per side until biscotti are hard and dry. Combine all the spices and mix well. This recipe will make more than you need for the biscotti. Use as indicated in the recipe. These are honestly one of the best cookies I have ever tried. They are not your average chocolate cookie. Rather, you taste the chocolate and then you notice a certain je ne sais quoi that you can't quite put your finger on. All I can say is that the combination makes for a very memorable cookie. The key to this recipe is in the spices - cinnamon, ginger, allspice, cardamom, and white pepper. I know what you're thinking, white pepper? Really? I promise that it does not overpower the cookie in any way, nor does it make the cookie into some sort of red-hot baked good. It plays well with the other spices with each lending their subtle nuances to the other to form something completely different and delicious. I also recommend that you do not omit the cardamom. I realize it's one of those high-end ingredients that you'd normally pass on because of the exorbitant price. But, if you know where to look, you can find it for a very low price. World Market actually sells an entire packet of it for only 99 cents. So, now that you know where to find it, go out and buy it so you can make this cookie. 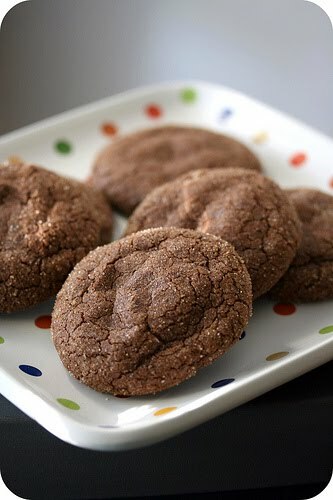 As for the texture of these cookies, they come out a little cakey and a little chewy with a crisp exterior due to the sugar coating. They are definitely something that you'll want to make again and again. Notes: I decreased the sugar from the original recipe by 1/4 cup. I think they're plenty sweet enough without the extra. Also, it is not recommended that you flatten the balls of dough since it'll be too difficult to get them off the cookie sheet after they bake. Combine the sugar and spices. Remove 1/2 cup of the mixture and set aside for rolling the cookies. Add the cocoa powder to the 1 1/2 c. of sugar-spice mixture and blend. Cream butter with the cocoa-sugar mixture. Add eggs and vanilla. Add the flour and baking powder. Form tablespoon-sized balls and roll in the reserved sugar mixture. Bake at 350F for 12-15 min. Let cool on the pan for a few minutes before transferring to a rack to cool. A few days ago, Gourmet-Mom-on-the-Go posted this recipe for White Chocolate Potato Chip Cookies. The idea of cookies that were salty and sweet totally appealed to me. Plus, I had some odds-and-ends ingredients, including potato chips, that I needed to use up. I made the cookies last night, but substituted butterscotch chips since that's what I had in my fridge. I also added in some Rice Krispies for added crunch. Unfortunately, I couldn't really taste the potato chips. They kind of got lost in there among the butterscotch chips. Hence, I ended up with a good butterscotch cookie. Not quite what I was hoping for, but definitely still enjoyable. I'm thinking that using butterscotch chips might have been too sweet and that semisweet chocolate chips might match better with the potato chips, that and adding in more potato chips. At any rate, it's a good recipe to use when you have a little of this and a little of that hanging around in your pantry. Whip butter with sugar. Add salt, vanilla, and eggs. Add flour. Stir in the potato chips and chocolate chips. Drop by tablespoonfuls onto a greased cookie sheet and bake 8-11 min. until edges are golden.